MQTT is a publish-subscribe-based messaging protocol used in the internet of Things. It works on top of the TCP/IP protocol, and is designed for connections with remote locations where a "small code footprint" is required or the network bandwidth is limited. The goal is to provide a protocol, which is bandwidth-efficient and uses little battery power. The previous tutorial used HTTP as its transport mechanism between the devices and the IoT Agent. HTTP uses a request/response paradigm where each device connects directly to the IoT Agent. MQTT is different in that publish-subscribe is event-driven and pushes messages to clients. It requires an additional central communication point (known as the MQTT broker) which it is in charge of dispatching all messages between the senders and the rightful receivers. Each client that publishes a message to the broker, includes a topic into the message. The topic is the routing information for the broker. Each client that wants to receive messages subscribes to a certain topic and the broker delivers all messages with the matching topic to the client. Therefore the clients don’t have to know each other, they only communicate over the topic. This architecture enables highly scalable solutions without dependencies between the data producers and the data consumers. The UltraLight 2.0 IoT Agent will only send or interpret messages using the UltraLight 2.0 syntax, however it can be used to send and receive messages over multiple transport mechanisms. Therefore we are able to use the same FIWARE generic enabler to connect to a wider range of IoT devices. This application builds on the components created in previous tutorials. 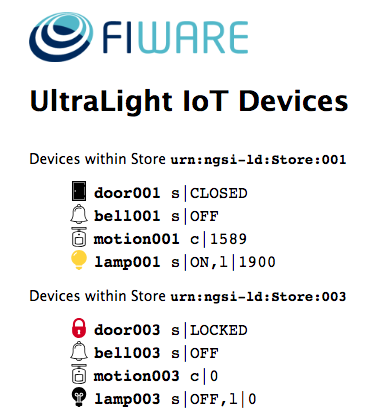 It will make use of two FIWARE components - the Orion Context Broker and the IoT Agent for UltraLight 2.0. Usage of the Orion Context Broker (with proper context data flowing through it) is sufficient for an application to qualify as “Powered by FIWARE”. Both the Orion Context Broker and the IoT Agent rely on open source MongoDB technology to keep persistence of the information they hold. We will also be using the dummy IoT devices created in the previous tutorial Additionally we will add an instance of the Mosquitto MQTT broker which is open source and available under the EPL/EDL. 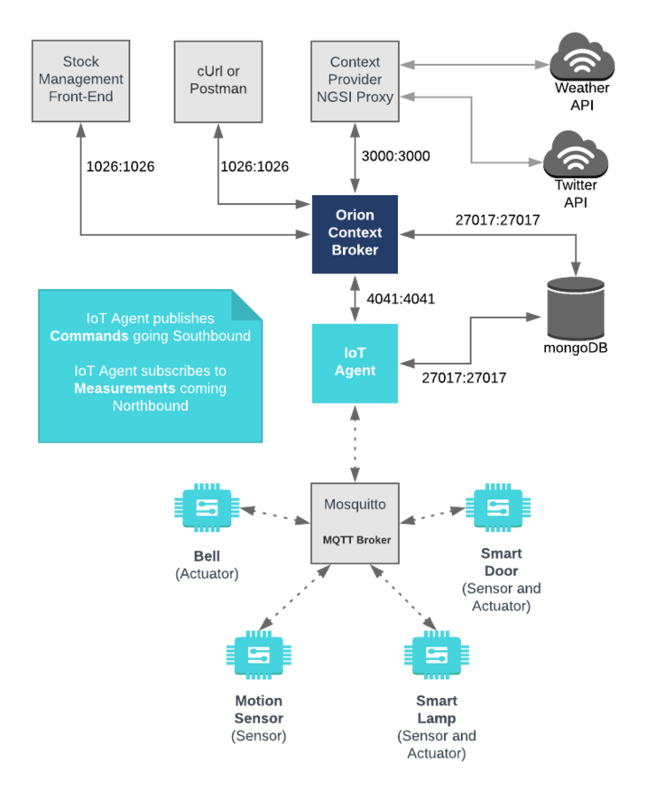 The Mosquitto MQTT Broker which acts as a central communication point, passing MQTT topics between the IoT Agent and IoT devices as necessary. A webserver acting as set of dummy IoT devices using the UltraLight 2.0 protocol running over MQTT. Since all interactions between the elements are initiated by HTTP or MQTT requests over TCP, the entities can be containerized and run from exposed ports. The attached volume is a configuration file used to increase the debug level of the MQTT Message Broker. Port 4041 is exposed purely for tutorial access - so that cUrl or Postman can make provisioning commands without being part of the same network. We will start by mimicking the roles of both the IoT Agent and a dummy IoT device and send and receive some messages using MQTT. This section of the tutorial requires several open terminals. Eventually once we have wired by the system correctly, IoT Agent will subscribe to all relevant events to listen for northbound traffic in the form of sensor measurements. It therefore will need to make a subscription across all topics. Similarly an actuator must subscribe to a single topic to receive events which effect itself when commands are sent southbound. To check that the lines of communication are open, we can subscribe to a given topic, and see that we are able to receive something when a message is published. A sensor sending northbound measurements will publish to those measurements to the MQTT Broker to be passed on to any subscriber than wants them. The sensor will not need to make a connection to the subscriber directly. What if I get a Failed to connect to localhost port 4041: Connection refused Response? If you get a Connection refused response, the IoT Agent cannot be found where expected for this tutorial - you will need to substitute the URL and port in each cUrl command with the corrected IP address. All the cUrl commands tutorial assume that the IoT Agent is available on localhost:4041. You should see four containers running. If the IoT Agent is not running, you can restart the containers as necessary. This command will also display open port information. 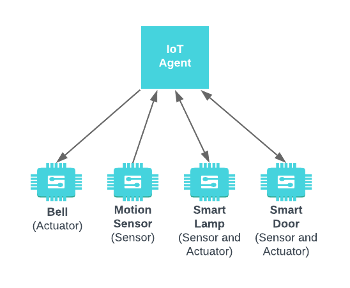 The IoT Agent acts as a middleware between the IoT devices and the context broker. It therefore needs to be able to create context data entities with unique IDs. Once a service has been provisioned and an unknown device makes a measurement the IoT Agent add this to the context using the supplied <device-id> (unless the device is recognized and can be mapped to a known ID. fiware-service header is defined so that entities for a given service can be held in a separate mongoDB database. fiware-servicepath can be used to differentiate between arrays of devices. For example within a smart city application you would expect different fiware-service headers for different departments (e.g. parks, transport, refuse collection etc.) and each fiware-servicepath would refer to specific park and so on. This would mean that data and devices for each service can be identified and separated as needed, but the data would not be siloed - for example data from a Smart Bin within a park can be combined with the GPS Unit of a refuse truck to alter the route of the truck in an efficient manner. The Smart Bin and GPS Unit are likely to come from different manufacturers and it cannot be guaranteed that there is no overlap within <device-id>s used. The use of the fiware-service and fiware-servicepath headers can ensure that this is always the case, and allows the context broker to identify the original source of the context data. Invoking group provision is always the first step in connecting devices. For MQTT communication, provisioning supplies the authentication key so the IoT Agent will know which topic it must subscribe to. It is possible to set up default commands and attributes for all devices as well, but this is not done within this tutorial as we will be provisioning each device separately. The resource attribute is left blank since HTTP communication is not being used. The URL location of cbroker is an optional attribute - if it is not provided, the IoT Agent uses the default context broker URL as defined in the configuration file, however it has been added here for completeness. It is common good practice to use URNs following the NGSI-LD specification when creating entities. Furthermore it is easier to understand meaningful names when defining data attributes. These mappings can be defined by provisioning a device individually. static_attributes are as the name suggests static data about the device (such as relationships) passed on to the context broker. Note: in the case where individual ids are not required, or aggregated data is sufficient the attributes can be defined within the provisioning service rather than individually. In the request we are associating the device motion001 with the URN urn:ngsi-ld:Motion:001 and mapping the device reading c with the context attribute count (which is defined as an Integer) A refStore is defined as a static_attribute, placing the device within Store urn:ngsi-ld:Store:001. The addition of the transport=MQTT attribute in the body of the request is sufficient to tell the IoT Agent that it should subscribe to the /<api-key>/<device-id> topic to receive measurements. The value of the -m parameter defines the message. This is in UltraLight syntax. The value of the -t parameter defines the topic. Note In the previous tutorial, when testing HTTP connectivity between the Motion Sensor and an IoT Agent, a similar dummy HTTP request was sent to update the count value. This time the IoT Agent is configured to listen to MQTT topics, and we need to post a dummy message to an MQTT topic. When running using the MQTT transport protocol, the IoT Agent is subscribing to the MQTT topics and the device monitor will be configured to display all MQTT messages sent to each topic - effectively it is showing the list messages received and sent by Mosquitto. 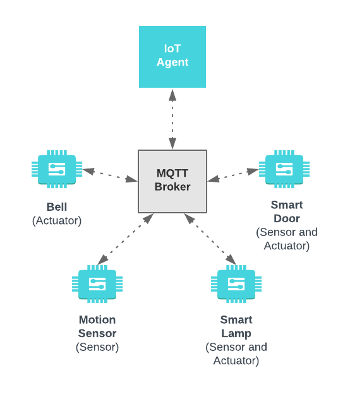 With the IoT Agent connected via MQTT, the service group has defined the topic which the agent is subscribed to. Since the api-key matches the root of the topic, the MQTT message from the Motion Sensor is passed to the IoT Agent which has previously subscribed. Because we have specifically provisioned the device (motion001) - the IoT Agent is able to map attributes before raising a request with the Orion Context Broker. You can see that a measurement has been recorded, by retrieving the entity data from the context broker. Don't forget to add the fiware-service and fiware-service-path headers. The response shows that the Motion Sensor device with id=motion001 has been successfully identified by the IoT Agent and mapped to the entity id=urn:ngsi-ld:Motion:001. This new entity has been created within the context data. The c attribute from the dummy device measurement request has been mapped to the more meaningful count attribute within the context. As you will notice, a TimeInstant attribute has been added to both the entity and the metadata of the attribute - this represents the last time the entity and attribute have been updated, and is automatically added to each new entity because the IOTA_TIMESTAMP environment variable was set when the IoT Agent was started up. Provisioning an actuator is similar to provisioning a sensor. The transport=MQTT attribute defines the communications protocol to be used. For MQTT communications, the endpoint attribute is not required as there is no HTTP URL where the device is listening for commands. The array of commands is mapped to directly to messages sent to the /<api-key>/<device-id>/cmd topic The commands array includes a list of each command that can be invoked. The example below provisions a bell with the deviceId=bell001. If you are viewing the device monitor page, you can also see the state of the bell change. The result of the command to ring the bell can be read by querying the entity within the Orion Context Broker. The TimeInstant shows last the time any command associated with the entity has been invoked. The result of ring command can be seen in the value of the ring_info attribute. Provisioning a device which offers both commands and measurements is merely a matter of making an HTTP POST request with both attributes and command attributes in the body of the request. Once again the transport=MQTT attribute defines the communications protocol to be used, and no endpoint attribute is required as there is no HTTP URL where the device is listening for commands. The full list of provisioned devices can be obtained by making a GET request to the /iot/devices endpoint. Having connected up the IoT Agent to the IoT devices, we now need to inform the Orion Context Broker that the commands are available. In other words we need to register the IoT Agent as a Context Provider for the command attributes. All the communications leaving and arriving at the North port of the IoT Agent use the standard NGSI syntax. The transport protocol used between the IoT devices and the IoT Agent is irrelevant to this layer of communication. Effectively the IoT Agent is offering a simplified facade pattern of well-known endpoints to actuate any device. The Bell entity has been mapped to id="urn:ngsi-ld:Bell:001" with an entity type="Bell". To register the command we need to inform Orion that the URL http://orion:1026/v1 is able to provide the missing ring attribute. This will then be forwarded on to the IoT Agent. As you see this is an NGSI v1 endpoint and therefore the legacyForwarding attribute must also be set. To invoke the ring command, the ring attribute must be updated in the context. The Smart Door entity has been mapped to id="urn:ngsi-ld:Door:001" with an entity type="Door". To register the commands we need to inform Orion that the URL http://orion:1026/v1 is able to provide the missing attributes. This will then be forwarded on to the IoT Agent. As you see this is an NGSI v1 endpoint and therefore the legacyForwarding attribute must also be set. To invoke the open command, the open attribute must be updated in the context. The Smart Lamp entity has been mapped to id="urn:ngsi-ld:Lamp:001" with an entity type="Lamp". To register the commands we need to inform Orion that the URL http://orion:1026/v1 is able to provide the missing attributes. This will then be forwarded on to the IoT Agent. As you see this is an NGSI v1 endpoint and therefore the legacyForwarding attribute must also be set. To switch on the Smart Lamp, the on attribute must be updated in the context.